Analog multipliers are employed in many applications. In RF front-ends, for example, they are widely used for frequency conversion tasks. For noncoherent receivers such as energy detectors or transmitted-reference front-ends, they need to be able to multiply arbitrary (broadband) input signals. Unfortunately, there exist no ideal hardware realization of such devices, hence they inevitably create undesired signal content at their output. To be able to deal with these effects or correct for them, we need to be able to model and identify realistic RF multipliers. 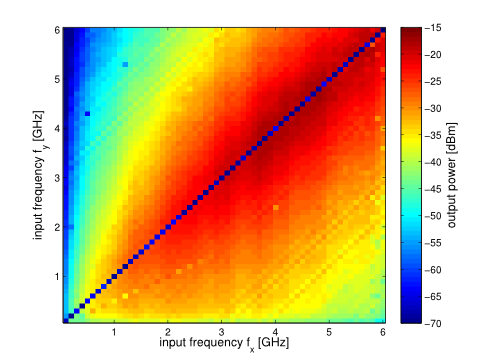 We proposed and validated an accurate multiple-input single-output Wiener-Hammerstein model for ultra-wideband analog multipliers. The model consist of input and output filters and a bivariate polynomial kernel that can model accurately ultra-wideband analog multipliers. The model is flexible and, due to its structure, gives insight in the behavior of such devices. Additionally it provides the possibility to study the realistic behavior of systems involving those multipliers, e.g. the influence of undesired nonlinear signal content. We also proposed a method which facilitates easy and accurate identification of the model parameters as filter frequency responses and polynomial coefficients. The figure shows the measured magnitude response of two dimensional frequency sweep measurements which are used to estimate the input and output filter frequency responses. We have shown that the proposed model and identification method reaches the accuracy of Agilent ADS circuit simulations but with less computational effort. This work was presented at the "IEEE Forum on Signal Processing for Radio Frequency Systems 2013" where it was awarded with the Best Student Contribution Award.